Poor foreign language skills among the British workforce are leaving the UK under-represented in European Union institutions, an official has said. 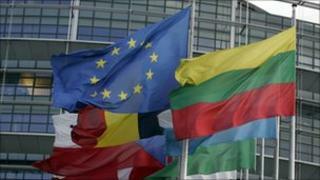 The head of the European Parliament's London information office has warned of a "serious problem". Only 5% of the jobs in the European Parliament and Commission are taken by British workers - although the UK contains 12% of the EU's population. The government is aiming to reverse a decline in language study in schools. On Monday, for the first time, the European Parliament and European Union are holding an open day for UK school leavers and graduates encouraging them to think of a career in Brussels or Strasbourg. Michael Shackleton, who runs the European Parliament's communications operation in the UK, said: "People like me are coming to retirement and its very clear there are not enough people to take our places. "I think it matters at all levels of the institutions not just at the highest levels - having people from British backgrounds adds to the mix, it's really important if you want to influence what is going on." "The balance of the use of language has been in favour of English, but to understand what people are thinking about you also have to get a sense of them and how they see the world," he added. Since the last government made learning foreign languages optional in England from the age of 14 there has been a decline in the numbers of students studying them to GCSE level. The proportion of students taking language GCSEs has fallen from 61% in 2005 to 44% in 2010. In 2001, about 347,000 pupils sat GCSE French, but this has fallen by nearly half to fewer than 178,000 in 2010. There is a similar pattern for German language studies, with more than 135,000 sitting the exam in 2001, but only about 70,000 in 2010. However, the coalition government has introduced the English Baccalaureate, which will be awarded to students gaining good GCSE passes in English, maths, two science qualifications, a foreign or ancient language, and history or geography. The number of pupils gaining the EBacc will be included in schools' league tables data, and demand for language teachers has increased, as institutions have moved to boost baccalaureate subjects. At Hendon School, in north London, a specialist language school which is also a mixed ability comprehensive drawing children from a wide range of different communities, every child has to study French, Spanish or German - and Japanese is offered at GCSE and A-level. Deputy head teacher Rebecca Poole said she expected to see "a renaissance" in language learning and language teaching. "In my opinion that can only be an excellent thing," she said. "I think there will be a lot of jobs advertised out there." However, in January, the education watchdog Ofsted warned that language lessons were "weak" in too many secondary schools in England. And concerns about the decline are also shared in Scotland, Wales and Northern Ireland, where foreign language learning to the age of 16 is also not compulsory - although all pupils in Wales must study Welsh to that age.